We know many thrift stores get aggressively solicited by website design companies, your friends, and even your own clients who want to make a website for you. Some possibly costing hundreds or even thousands of dollars. Some even offer free websites if you are willing to possibly compromise the privacy of your clients. Our goal at ThriftStoreWebsites.com is to empower you to create your own web site with the many Thrift Store specific features we offer so that your website will display your unique image and internet message and effectively interface with your overall store management. Quick and Easy Start Up - You select your template and then a 40+ page website is instantly created for you. You may then add/modify any pages you wish. When you are satisfied with the look and functionality, we will help get your site "live." NO START UP FEE! Easy Access at anytime - Work from any computer connected to the internet using any web browser from Microsoft Explorer, Firefox or Chrome. There is no software to buy, install or update. We do all that for you on our internet servers. Affordable - No need to pay someone thousands of dollars for an initial start up site, then incur additional time and expenses for future changes and updates. With a Thrift Store Website you pay one low monthly fee for all your web site changes, updates, web site hosting and private eMail boxes. Simple and Easy to Use - Our text and images editors work like an embeded word processor for simple keyboard typing. No special programming (HTML) skills are required. Page Headers and Footers can be customized with your logos or other unique artwork to match your store image and internet message. Unlimited Page Content - You can add any text or image content to as many pages as you like. There are no additional charges for the number of pages (or monthly traffic levels) on your web site. Interactive - Live interactive Google Map. Add donation forms, employment forms, customer feedback, events calendar, newsletters, slide shows, video, audio or flash animations, even add your own custom coupons for your customers to print. Custom Services - Our custom services team can bring all your visions to life. We can do Flash, logos, headers, or build a complete custom template for you. All accounts recieve 2 hours free after billing information is collected. This can be used towards any kind of custom graphics you want. Secure and Private Web Sites - ThriftStoreWebsites.com will always respect and preserve the privacy of you, your clients and all visitors to your web site. We will never ask you to provide any information about you or your clients, nor will we share any information about you, your clients or visitors to your web site with any third party vendors for any reason. Online and Direct Telephone Support - Includes an entire website with help tutorials, Live Chat, and phone support. We also offer full "Do It For Me" web site assistance. 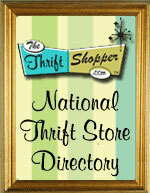 ThriftStoreWebsites.com can help you get your web site published when you need help.